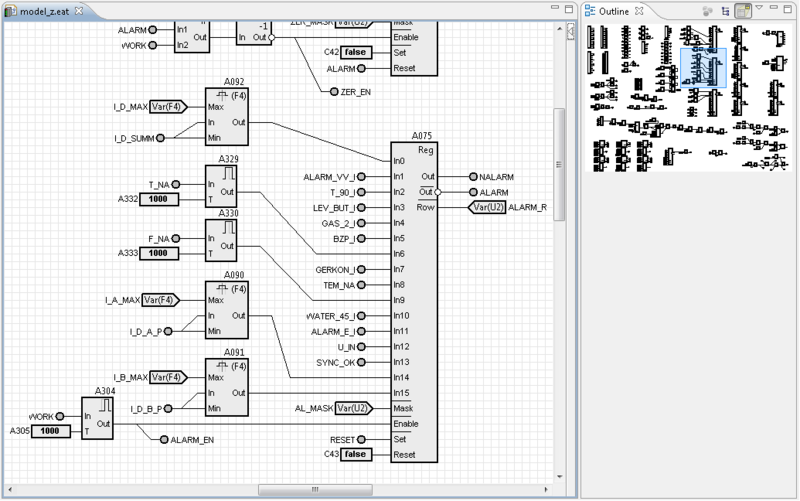 The development environment EAT-Eclipse designed for the design and implementation of embedded software applications (SoftLogic-System) for PC-compatible controllers and controllers based on Atmel AVR XMEGA (controller «Proton», controller «Zenith», and other). Based on EAT-Eclipse developed the voltage converters and frequency converters of different power and circuit designs, control systems for industrial drives, recorders events and signals, as well as possible to implement the full range of industrial automation. The vast majority of products MIKONT Ltd have a control system with software designed in EAT-Eclipse. This development environment is built on the concept of Model Driven Software Development. During project development, the user creates a model of the application that contains the complete formal description of the embedded application. 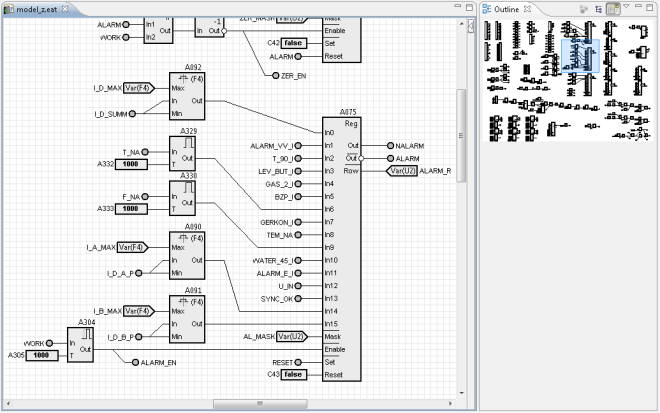 On the basis of the model is automatically generated ready to compile the application project. 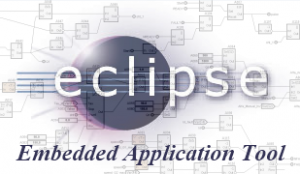 Development environment EAT-Eclipse provides a means to describe the project in the domain-specific language (DSL) with a graphical notation in the form of circuits of the interconnected functional blocks. This language is focused on a specific area of application, thereby achieving high efficiency of its use by domain without software engineers. In fact, in this specialized language user creates a formal description of the applications that sufficient for the automatic generation of source code for the target universal programming language. In this system, the target language is language C. After autogeneration of source code - compile them, you can get the application executable file. The system provides a means of expanding by allowing the user to create new functional units - functional blocks and device drivers. Below are examples of the parts real projects in the EAT-Eclipse. 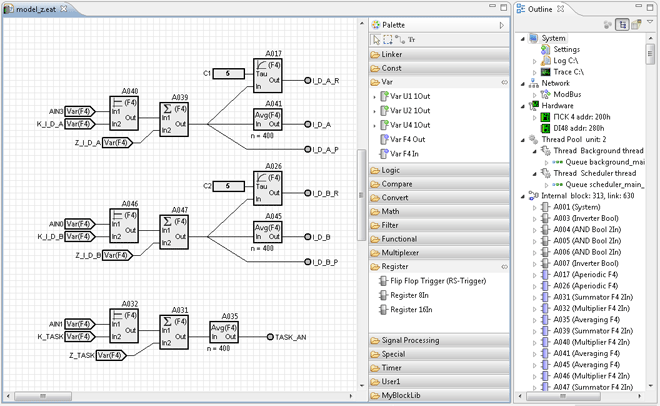 Fig.1 Part of the control system project for the electrolytic rectifier 10000 A. Production of hydrogen. Fig.2 Part of the project control system for the electrolytic rectifier 10000 A. Production of hydrogen. 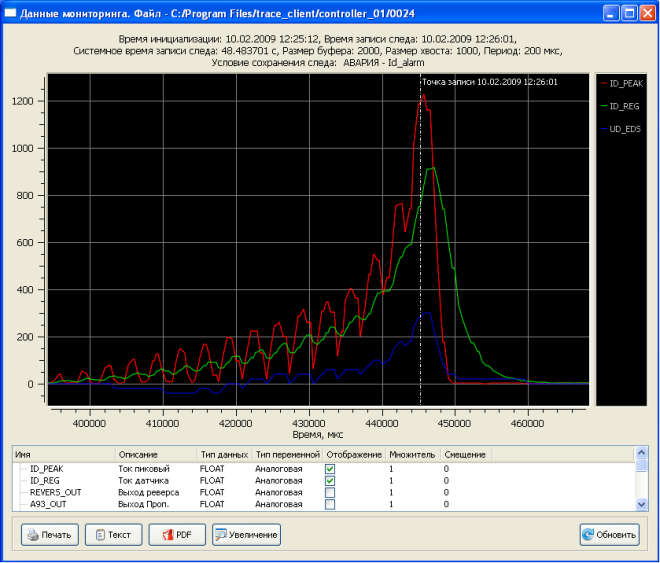 Fig.3 Example of result working of monitoring subsystem. Shows the development of an emergency in the work of control system the thyristor converter. Data of monitoring system in viewer, at the bottom - the reported data in the file. The graph shows the growth of the motor current to the alarm value and the result of the safety system action. Time of the accident on the graph indicated by a vertical marker. Monitoring subsystem parameters the user sets in the development environment. Fig.4. 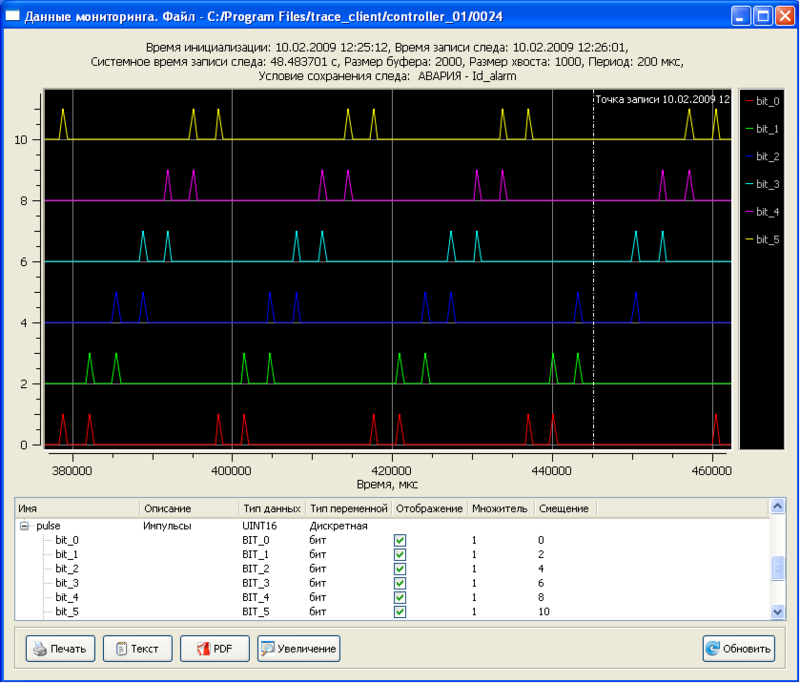 Example of result working of monitoring subsystem. Visualization of discrete signals of the control pulses thyristor converter. The demo version does not support the save files models and does not support code generation C-files based on the application model. Accordingly demo version allows you to view and edit examples of models, but you can not save changes.